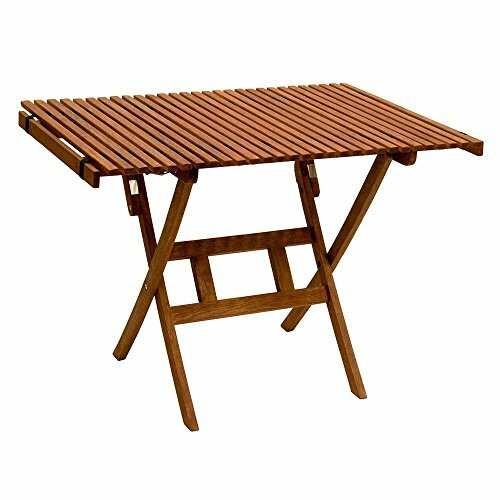 This unique Roll Top Table is crafted in Vietnam from Eucalyptus Grandis wood. The entire table fits into handy carry bag, yet assembles quickly WITHOUT tools. Beautifully designed and stable, seats 4, perfect for your next outing, backyard use or anywhere you need an extra table. STRONG: Crafted from eucalyptus grandis wood indigenous to Southeast Asia. BEAUTIFUL: Finished with oil for a beautiful color. PORTABLE: Big enough to accommodate 4 adults but easy to transport and store. EASY: Easy to assemble with snap quick latches. Requires no tools.